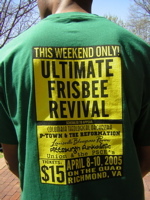 A few further notes about Saturday’s Ultimate Frisbee Revival match at Union Theological Seminary and Presbyterian School of Christian Education, which I mentioned in my last post. The photos tell part of the story, including the inexplicable appearance of a Presbyterian seminary student in a gorilla suit, infiltrators from West Virginia singing along to John Denver, and some nice action shots against the backdrop of Union’s campus. The rest? Well, only a Presbyterian would laugh at the cheers of “Let’s go, Calvin, let’s go!” and similar attempts to cheer on the teams with theologians (my own contribution, “Bonhoeffer! Bonhoeffer! Sis Boom Bah!” met with stony silence). But the music (including the incongruous site of a full team of Union players descending for their opening kickoff to the strains of Led Zeppelin’s “Immigrant Song”); the architecture of the campus, which ranges from the late 19th century chapel at one end of the quad to the campus library (in the converted old Ginter Park Presbyterian Church, and complete with a gargoyle of the long-time librarian); and the overall fantastic light and cheery spectators made for a great day. I’m still recovering from my mild sunburn but otherwise very pleased with the day. Big congrats to David Paul, who visited us with Esta in January, as well as the other organizers of the match. If I had to pick just sixteen hours to spend visiting Esta and getting to know her classmates, I can’t think of a better way to spend my time.